Joyce N. Napier, 88 , of Bellwood, died Thursday, January 4, 2018, at the Butler County Healthcare Center in David City. 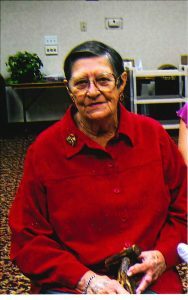 Funeral Service Tuesday, January 9, 2018 10:30 A.M.
Joyce Nadean Napier was born July 27, 1929, in York, Nebraska to William and Hazel (Hascall) Hunsche. She received her education in York Schools. She married Darald Napier in Seward, Nebraska in 1947 and they made their home in Bellwood. Joyce was a Quality Control Inspector on the factory line at Dale Electronics in Columbus for many years, where she made many good friends. She was a member of the Bellwood United Methodist Church and loved spending time with her grandkids, watching their sporting events and listening on the radio when she couldn’t attend. Joyce liked to crochet, enjoyed going to horse races, visiting with friends, watching the birds, and she and Darald enjoyed dancing. She also cared for her cats. Joyce is survived by her son and daughter-in-law Lowell (Joyce A.) Napier of Bellwood, Grandson Lance (Cindy) Napier of Bruno, Granddaughter Nicole (Wes) Rohloff of Bellwood, great grandsons Mitchell Napier of David City, Lane and Kyle Napier of Bruno, Joseph and Jordan Rohloff of Bellwood. Sister Darla Bishop of Grand Island, Niece Jolene (Kurt) Karjalainen of Kearney. Sister-in-law Peggy (Harry) Wilson of Bellwood, nephews Brian and Travis Wilson, Bellwood. She was preceded in death by her parents, husband Darald (Jan. 27, 2014), Son Ricky Dean Napier, Step father Chris Wiegardt, Brothers and sister-in-law Lowell (Esther) Hunsche, Ron Bishop and Kenny Stava, Brother-in-law Bill Napier, Sister-in-law Sharon “Dolly” Napier.